Cabinets, cabinets, cabinets! Why do we actually need them? Number one answer is for storage – definitely for putting things away. 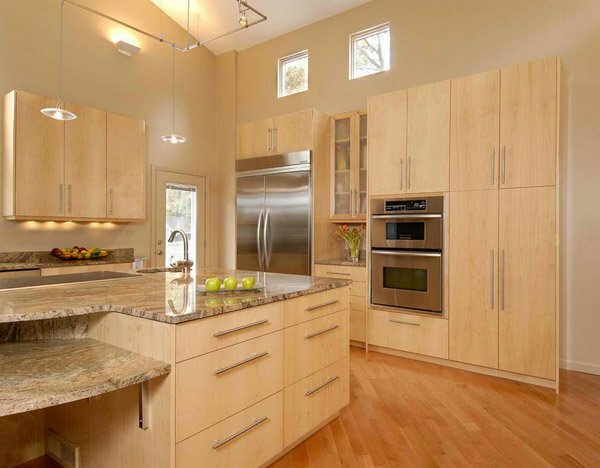 There are pretty much a couple of materials we can use for our kitchen cabinets at home; primary choice is wood. They can be made from Oak or Walnut, but whatever the wood choice you choose, always remember that maintaining is the key. 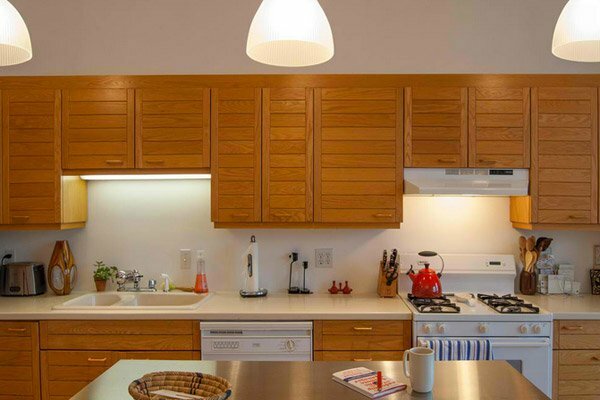 Today, we will be showing you 15 Contemporary Wooden Kitchen Cabinets. 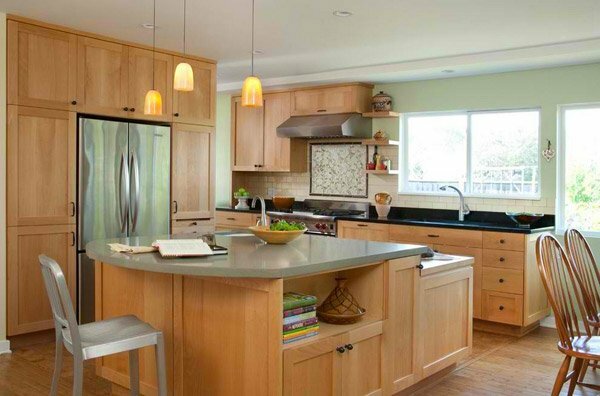 Before, we have already created a list about modern wooden kitchens and we got positive reviews. So now, we decided to be a little bit specific. We have created another list that will tackle on wood cabinet collections that we have handpicked over the internet. Without further ado, let us check out the list below. 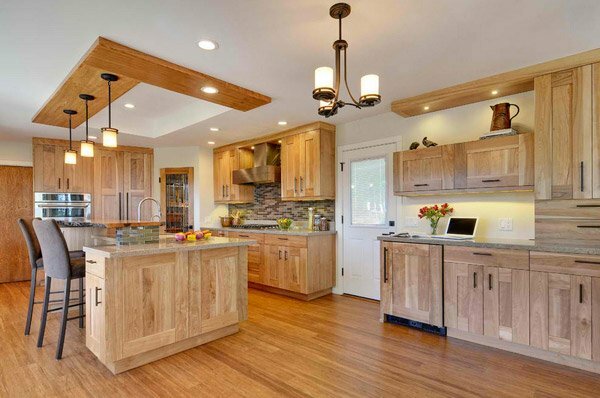 Simple natural maple cabinets and granite countertops create a clean and fresh look – and new appliances and better storage options greatly improve the functionality of the space, too. 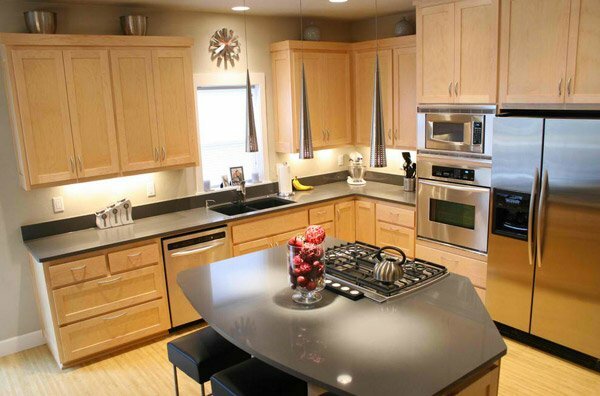 The cabinets are a natural maple with a high gloss finish which was paired with granite countertops. What more can be perfect? Light cabinets, tile floors, dark countertop – what more can you ask for in a small kitchen? The space may be small but using a modular system, we can pretty much say that this space is divine. 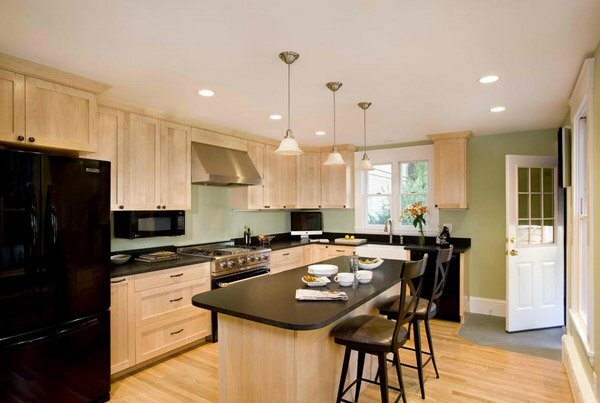 The Maple cabinetry in this Boston home is very pretty – it seems like you’re looking at a show house. 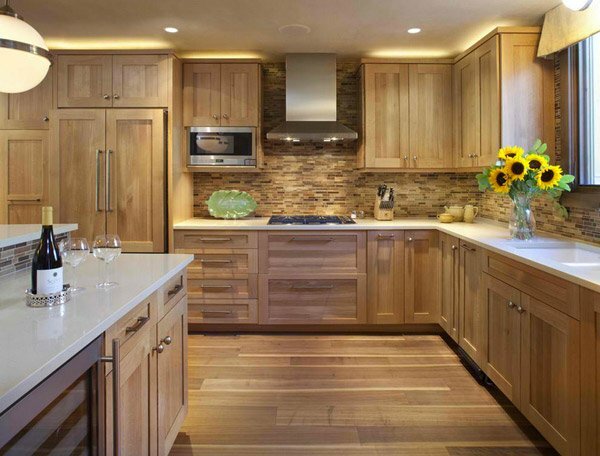 The warm tones of wooden cabinetry lend softness to the clean lines of the kitchen. Although the space receives only ambient natural light from the loft’s bank of windows, the stainless work table reflects to brighten the area from all angles. 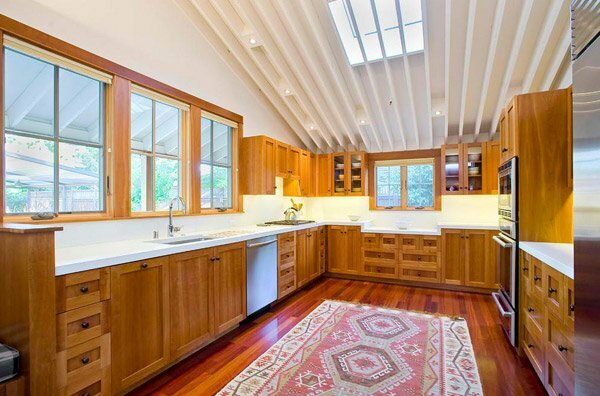 With walls this pretty, any design for wooden cabinets would really make this room stunning. Simple design, yet beautiful outcome. Widen the aisles. Whether you opt for the traditional work triangle or to break up your kitchen into work zones, pay attention to your kitchen’s aisle widths. 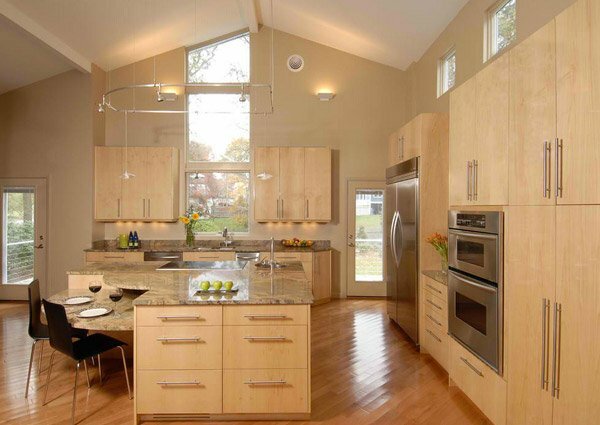 We note friends saying that the peninsula with stove and hanging cabinets is just magnificent. 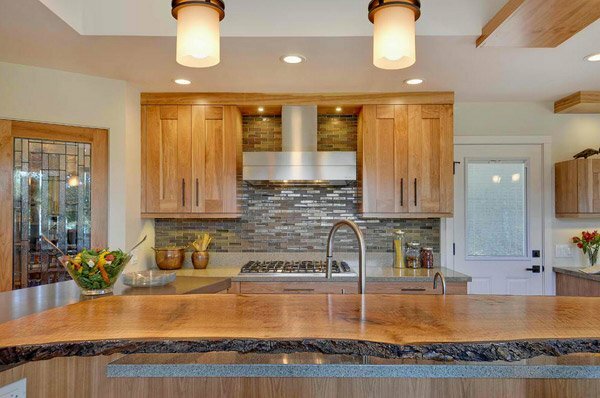 If you want to try your hand at making and finishing a wood countertop yourself rather than ordering a fully finished product, Waterlox is the sealer and finish that comes up repeatedly; just like how this kitchen space was done. 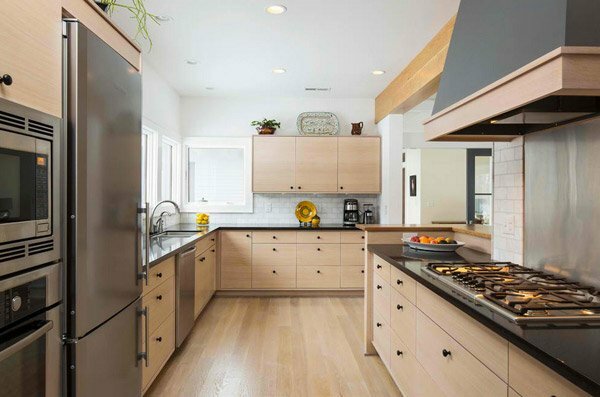 Jordan Iverson Signature Homes did great in choosing the cabinet color of clear lacquer on maple, the bamboo flooring, and the concrete color of Ceaserstone counter top. The light treatment done for this San Francisco home is just lovely – the pendants by the kitchen island are simple but definitely functional. The cabinets grain contrast with the flooring but sure looks great! 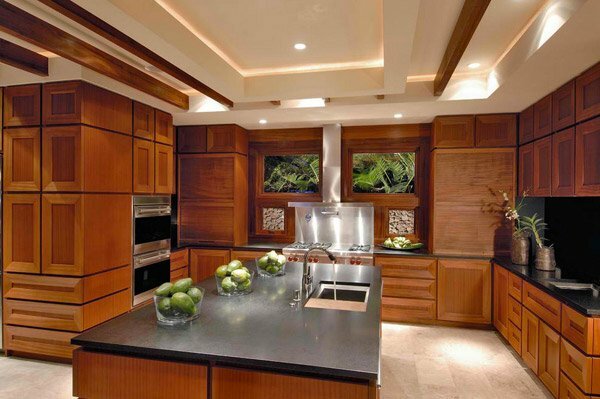 The counter top in this kitchen is honed absolute black granite; but note how astonishing the cabinets are. We can only hope we have them at home. The cabinets are white Oak quarter sawn and the floors are oiled Walnut. How do this kitchen space make you feel? In the kitchen more modern updates include white precast concrete countertops. “You walk up to it and you really don’t know what it is, but it has a sense of permanence, a quality that’s innate,” Willers says. And there you have it! 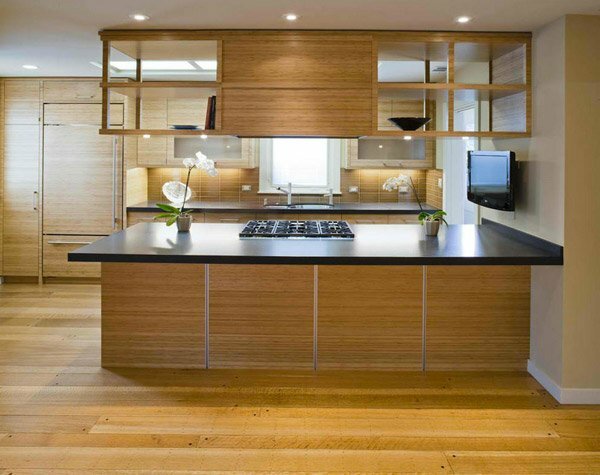 The 15 Contemporary Wooden Kitchen Cabinets for you own perusal. The list was pretty short but direct to the point – we can definitely say that the list was stunning even when they were not really out of the ordinary. Simple, functional and world class! Check out the 15 Perfectly Distressed Wood Kitchen Designs for more wooden cabinet inspiration! 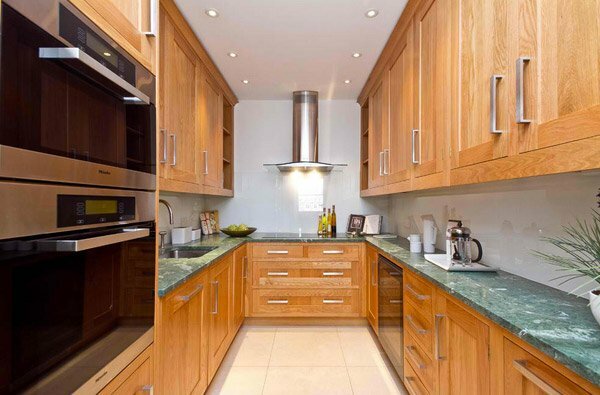 I have a customer who wants traditional oak kitchen cabinets can you quote just suppling the finished cabinets?